WATERSCAPING - Liquid Landscapes, Inc. Liquid Landscapes has become the premier waterscape specialist in the western North Carolina area. We build custom waterscapes that you can enjoy from your property year round. Every waterscape we design is made to fit seamlessly in the area and blend in naturally with the existing environment. We take great pride in providing the highest standard of workmanship while being able to tailor our designs exclusively for each client. Ponds are one of the most important ecosystems on the planet. They are the host to an interrelationship of all organisms in the environment, such as birds, fish, frogs, plants, and many microscopic organisms. Ponds not only create a natural ecosystem in their defined environment, but they also fit into the community or life cycle of the entire ecological region. As fewer wild places exist for native animals to inhabit, more and more people are creating habitats for the benefit of wildlife, as well as themselves. 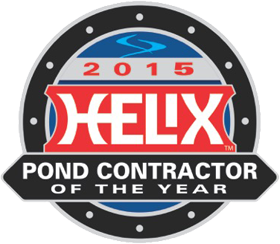 We provide all of our Pond Maintenance Services ‘a la carte’ to meet each client’s needs. Servicing and maintaining an eco system takes years of education and skill in order to guarantee the continued health of the waterscape. We are the top Pond Maintenance Company in Asheville and WNC for a reason… we are fully committed to the health and success of every waterscape we service. Water gardens have become a popular part of landscape architecture in the United States. Water gardens are visually soothing and seem to connect people to the aquatic world. The aesthetic value of water gardens is enhanced by the almost endless variety of design and planting options that make each one a unique and personal creation. A water garden is a wonderful way to enjoy the natural beauty of aquatic plants and animals. Waterfalls and streams capture the imagination of everyone that witnesses their beauty. People travel long exhausting hikes into the wilderness just to see a portion of a river, a waterfall, or a stream. They are inspiring and captivating, but why seek them out? It may be the feeling of being one with nature, or the contemplative feeling of peace we find within ourselves. We take extreme honor and pride in creating naturalistic waterfalls and streams that mimic what Mother Nature has created. 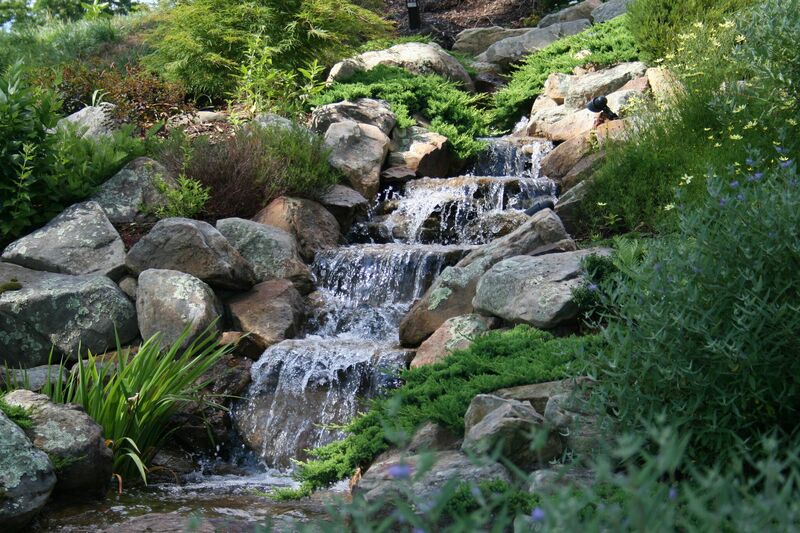 Disappearing water features are simply a re-circulating waterfall or stream without an exposed basin of water. You are able to enjoy the sight and sound of running water without an exposed pond. Why would you want a waterfall without a pond? “Pondless” designs are not for everyone, but it can be a great alternative for someone who isn’t quite sure that a pond is right for their family. The four major factors that entice people to a “pondless” design are safety, space, flexibility, and cost. It is a great alternative for those who are trying to get their feet wet, or just looking to fit a little bit of paradise into their own backyard. Fountains come in thousands of shapes and sizes. They can be stand alone fountains, bubbling urns, spitters, stone columns, or custom pieces of art. We at Liquid Landscapes can custom build any type of fountain that you can conceptualize. We work with metal, stone, and existing art structures. Fountains are generally used to add the sound of water to a deck or patio, but they can also be an anchor or focal point of a landscape. In many cases when it comes to the water garden, its primary purpose is to provide a suitable habitat for keeping koi. Koi are beautiful members of the Carp family that have been bread for over 200 years. Koi are prized by many water garden enthusiasts for their shimmering elegance and playful nature. A koi ponds’ main function is to provide a healthy and safe home for fish. Turtle habitats are very similar to that of koi, as their primary purpose is to provide a safe and healthy environment. Rain harvesting is a technique used for collecting, storing, and using rain water for landscape irrigation and other uses. The rain water is collected from various hard surfaces, such as rooftops and/or other types of manmade above ground hard surfaces. This ancient practice is currently growing in popularity throughout our communities due to interest in reducing the consumption of potable water and the inherent qualities of rain water. There are several components that make up a proper catchment system. The first component of the system is the catchment surface. The best catchment systems have hard, smooth surfaces, such as metal roofs or concrete areas. The next component is the distribution system. Gutters and downspouts channel the water from the catchment area to a holding container such as a barrel or cistern. Natural swimming pools were being built over 20 years ago in Austria and are still providing their owners with complete satisfaction. The idea started in the 1970’s with garden ponds. Interest in getting away from traditional chemical based swimming pools, an Austrian Ecologist, took the concept and developed it for commercial purposes through his company Biotop in 1985. At the same time, an independent water garden and aquatic plant specialist commenced building private natural swimming pools based on his own ecological system. Natural swimming pools, also referred to as natural swimming ponds, are a chemical free combination of swimming pool and bog garden. The swimming zone merges with the bog garden creating an environment that is intertwined and mutually symbiotic on one another. They are ecologically balanced with natural cleaning properties of plants with filtration and skimming systems, so there is no need for harmful chemicals. Shapes, appearance, and designs of natural swimming pools will vary, but all consist of a swimming area and regeneration zone. The health of a pool is affected by its size and shape. The larger the pond, the more likely it will be a better balanced ecosystem. The ecosystem of a natural swimming pool involves the interaction of water, sunlight, gases, minerals, plants, and creatures to ensure that the water is clean and healthy. Give us a call to set up a consultation on a natural swimming pool.